Realizing that his chopper was faster than the AN-2s, Moore decided to give chase, and Woods got his AK-47 ready for combat. 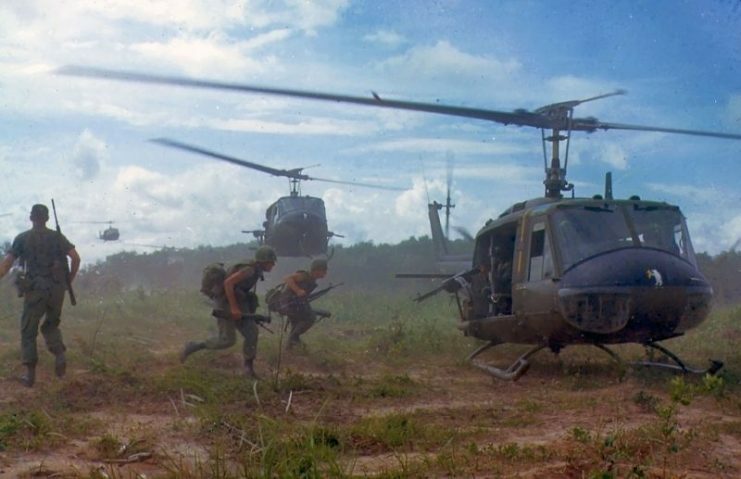 The Bell UH-1 Iroquois helicopter (known as the Huey) was one of the most widely used helicopters of the Vietnam War, with some 7,000 of them seeing service throughout the conflict. The Huey performed admirably in a number of roles, from medevac duties to ferrying troops from one site to another, and everything in between. On one occasion in the Vietnam War, though, a Huey became the first and only helicopter in aviation history to shoot down a biplane. The year was 1968, and Operation Thunder – the aerial bombing of military targets in the Democratic Republic of Vietnam, or North Vietnam – was in full swing. 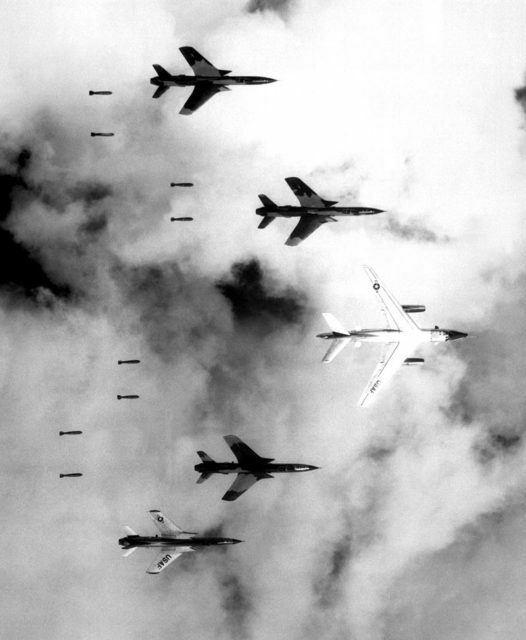 These bombing raids were having a crippling effect on the North Vietnamese war effort, and the North Vietnamese military command decided it was time to strike back. The target for the North Vietnamese reprisal was Lima Site 85 on the border between Laos and North Vietnam. This site was situated on top of a 5,800-foot karst mountain jutting out of the jungle. Because of its sheer cliffsides the site was accessible only by aircraft, or by foot up a steep single-file, winding trail on the mountainside. This near-inaccessibility, and the mountain’s proximity to North Vietnam – it was a mere 125 nautical miles from Hanoi – made it an ideal site for a US radar base. Site 85 (or Channel 97, as it was sometimes called) was one of a number of CIA-operated US radar bases established in supposedly-neutral Laos, but as the northernmost of these sites, Site 85 guided more successful strikes against North Vietnamese targets than any other base, which made it a prime target for a reprisal strike. A ground assault against Site 85 was deemed too risky to pull off, so instead North Vietnam decided to send a couple aircraft of their own to take out the site: four AN-2 Colt fixed-wing biplanes. Each AN-2 was armed under each lower wing with a 12-shot, 57 mm folding fin aerial rocket pod, as well as twenty 250 mm mortar rounds with aerial bomb fuses. These could be dropped out of the plane via a simple hinge mechanism. The LS-85 mountaintop area included radar shelters (“Operations”) with antennas and interior equipment normally in/on mobile AN/MSQ-77 “control and plotting” and radar vans. 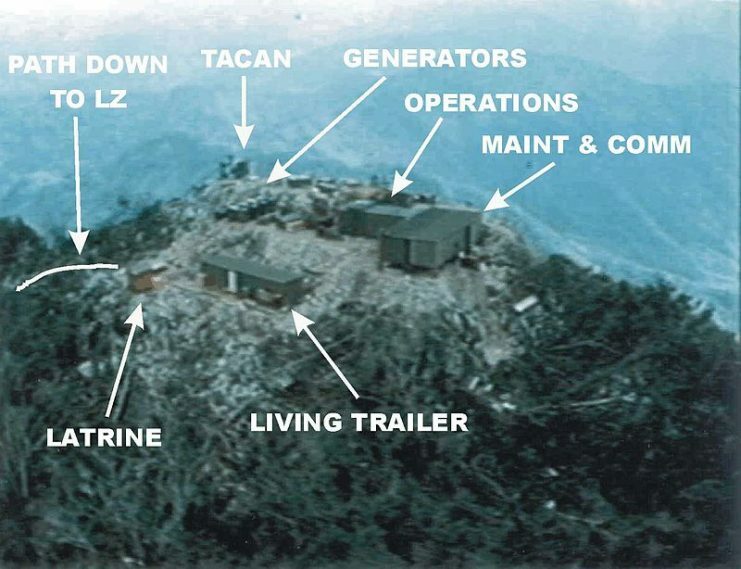 “TACAN” is the box shelter for the AN/TRN-17 electronics with antenna on top, and “LZ” is for the nearby helicopter Landing Zone. Also not shown are the CIA airstrip and command post. Site 85 was manned by a number of US Air Force airmen “sheep-dipped” as civilian employees of Lockheed Martin and Air America, as well as Hmong guerrillas and a few mercenaries. When the North Vietnamese bombing raid started, the men on the mountaintop were taken by surprise, but they reacted quickly. Of the four North Vietnamese biplanes, two attacked immediately while the others circled the site. The radar station was well camouflaged on the mountaintop, and the AN-2s had to fly in close and low to try to spot it and take it out. 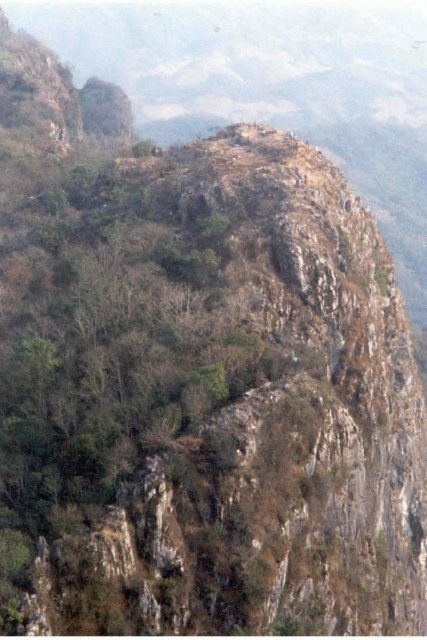 Phou Pha Thi, in northeastern Laos, the site of a U.S. TACAN facility known as Lima Site 85. 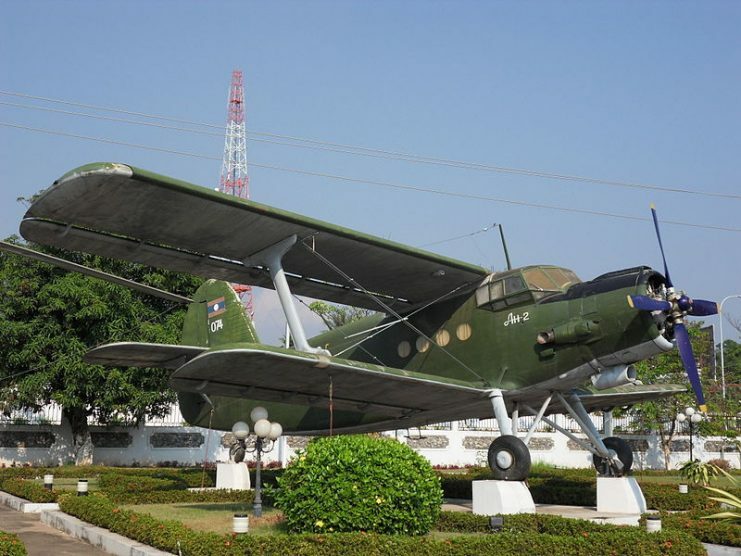 The first plane mistook another building for the radar site and started its attack, but at the sound of the rockets and bombs coming in, a Thai mercenary ran out into the open and emptied the entire clip of his AK-47 into the AN-2 and brought it down. Realizing that his chopper was faster than the AN-2s, Moore decided to give chase, and Woods got his AK-47 ready for combat. It didn’t take too long for the Huey to catch up to the slow, unwieldy biplanes, and soon it was in striking distance of the rearmost AN-2. 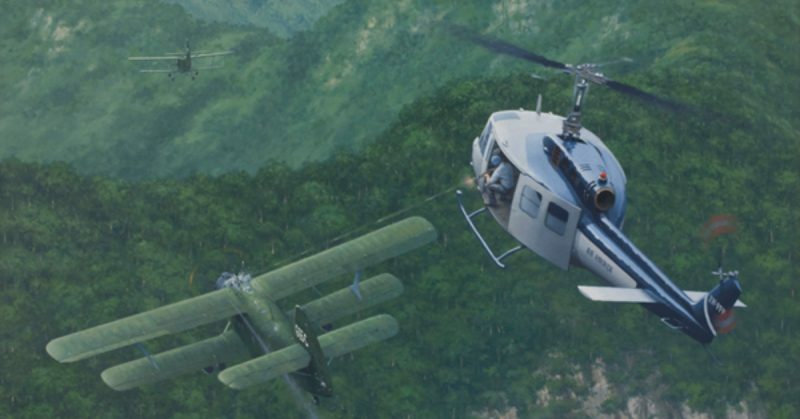 Because the rearward visibility of the AN-2 is severely limited, the pilot of the biplane didn’t realize the Huey was upon him until it was far too late. The downwash from the chopper caused the upper wing of the biplane to stall out, and it began to drop. In desperation, the pilot tried to lower his speed – but there was no getting out of this, because the Americans weren’t quite done with the attack. As Moore pulled in closer to the floundering biplane, Woods leaned out of the helicopter and emptied his AK-47 into the cockpit, wounding or killing both the pilot and the copilot. That was that: the biplane went into a spin and crashed into the jungle below. 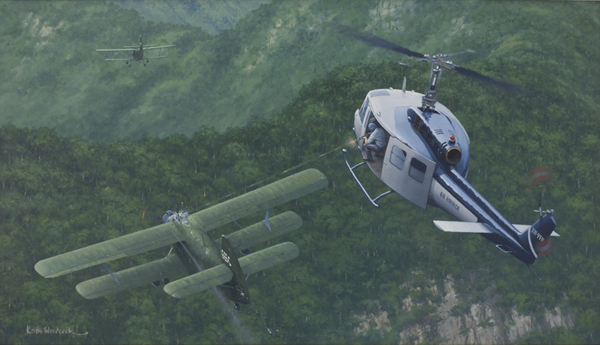 The Huey veered back toward Laos, and the other biplanes escaped into North Vietnam. This strange aerial victory would prove to be unique in the history of aerial combat – it was the first and only time a helicopter had taken out a biplane. It was also the first recorded air-to-air victory for the CIA. As for Site 85, though, the story would not end well. A mere two months after this incident, North Vietnamese commandos assaulted the radar station from the ground, and managed to get up onto the mountaintop and overrun the site. This attack resulted in the single largest loss of US airmen in a ground attack during the Vietnam War. The feat achieved by Moore and Woods in their UH-1 Huey against the North Vietnamese biplane, though, remains a rather unique episode of the war.